Bright, colourful pictures show scenes including “Fantastic flowers”, “Scrumptious fruit” and “By the garden pond”. With over 250 stickers to complete the scenes, this book will bring hours of fun, and encourage children to look more closely at the natural world around them. 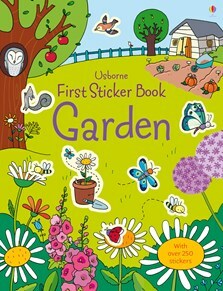 Culturebaby has also very much enjoyed her First Sticker Book Garden from Usborne... She’s developed quite an impressive gardening vocabulary and this series of activity books is great because she can do much of it herself. A wonderfully interactive and very educational book from Usborne that will be of great appeal to budding little gardeners.